FRASER ISLAND: Wind is most definitely not a fisherman's friend and the large swell has made it a bit difficult to get the lines to stay out over the last few days. Schools of mullet have been spotted north around Waddy Point, which means the tailor aren't too far away - as the boys from RBAC found out recently. Not to be deterred, a quick trip over smooth tracks to the sheltered western side has meant that reputations stay intact and that fish can still be served up for dinner. For those that love their flathead, there have been some beauties caught (and spotted) around Ungowa. 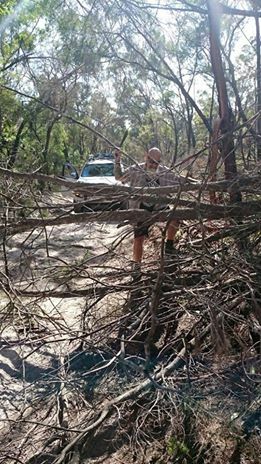 A big thanks too to Andreas Peuler who wrote in (via Facebook) to tell us he'd cleared some fallen trees from the track in to Ungowa late last month. There'll be some pretty happy fisherfolk on Fraser at the moment because of your good deed. Andreas hard at work on the track to Ungowa. The good news is the sun is shining and conditions are looking better for the back half of the week as we await the NW wind turn- around that'll see tailor on the bite. There's also been plenty of folks heading across from Dilli to Birrabeen on the southern lakes circuit drive, which is in great condition. You'll find Zoe R working in the Front Office at Eurong Beach Resort. We don't mind telling you that, when it comes to fishing, she gives visiting fisherfolk a run for their money.